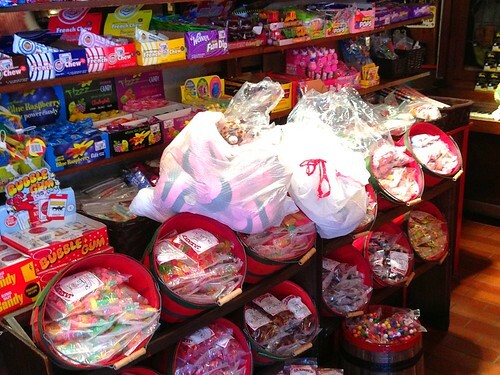 As you enter there’s a big candy store area where there’s all sorts of old-school sugary stuff for sale that adults should not be eating. But it’s impressive particularly if you are under 12. It’s hard to see the scale of what you are looking at, but this is a one pound cheeseburger made with twin 8oz burger patties. 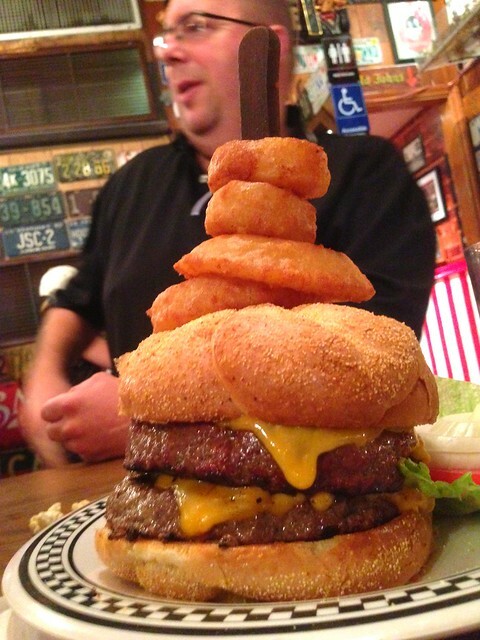 It is a very large burger, too big for a normal-sized person to eat. Chris and I split this monster in half. As burgers go I would have to say it was kind of ordinary after the novelty of its massiveness wore off. It was kind of uniformly grey in the middle, not particularly beefy in terms of flavor. It was just… BIG. This is actually not the biggest cheeseburger here either, they have a triple 8-ounce cheeseburger platter called the “Titanic” as well. The onion rings on the other hand which were arranged in a tower on top were actually very good, and you can order them just by themselves. I saw a whole bunch of Hammurabi-esque onion towers of Babel coming out of the pass that way, so it’s clearly a popular item. The “Artillery Dog” is at least a pound in weight, and comes with all of the trimmings. Again, Chris and I who are both champion fressers had to split this thing. Both of us felt the dog was superior to the burger in every respect, it was a nice firm beef dog with a good amount of spices in it. As we understand, this hot dog is custom made for Jaxson’s, but I’m unsure of the supplier. 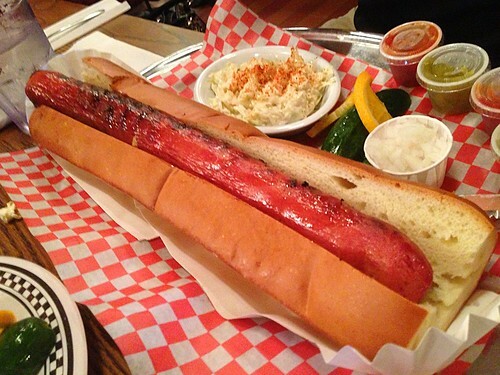 Clearly this is the biggest wiener that either Chris or I have ever seen in our lives. That’s what she said. The cone of french fries. The wives decided to eat some more normal-sized stuff, but even the regular sandwiches are pretty big. 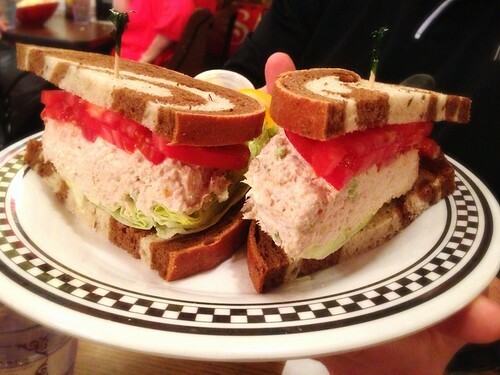 This was the tuna salad sandwich on marble rye. 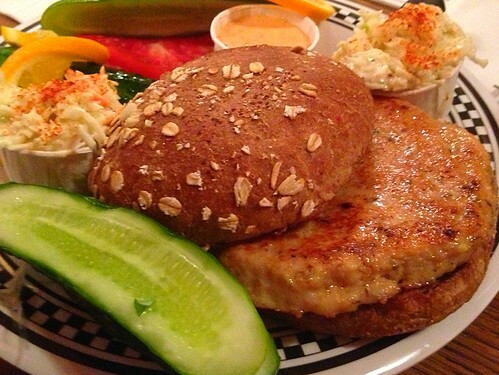 Chris’s wife got the turkey burger. As turkey burgers go, it actually looked pretty good. 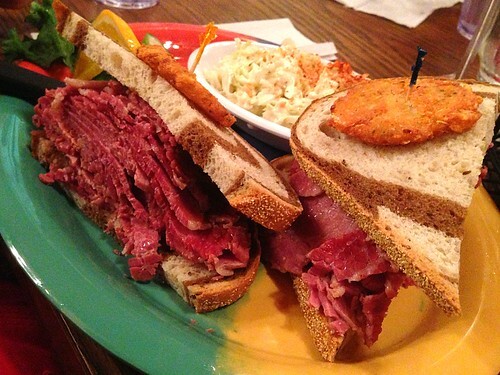 One of Chris’ teenage kids ordered the corned beef sandwich. Pretty sure he inhaled it. I love the little potato pancakes on top, that’s a nice touch. On to the main event, the ice cream. 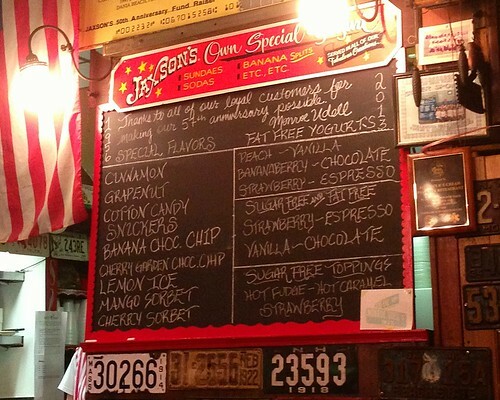 Jaxson’s makes all of its flavors in house and has all sorts of giant sundae creations you can order, including something called “The Kitchen Sink” which is actually served… in a sink. 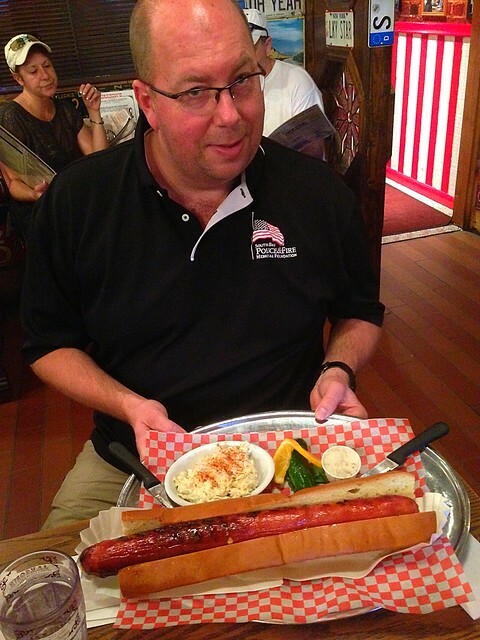 Unless you’ve got ten people to eat the thing, I strongly suggest you do not order one of those. 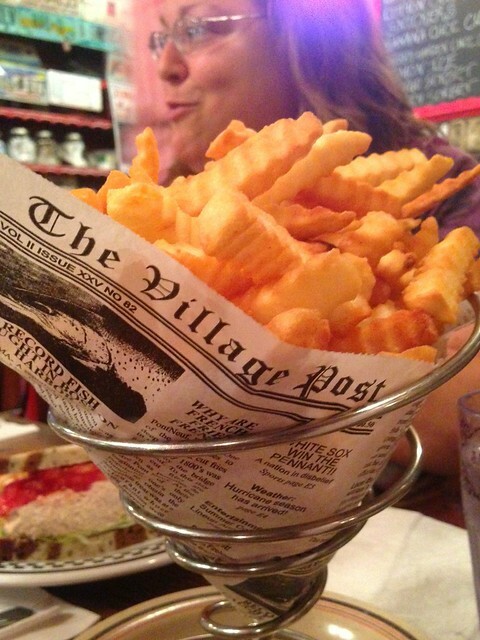 Chris’s wife ordered something normal-sized, which is entirely possible here. Probably the most sensible thing to do. 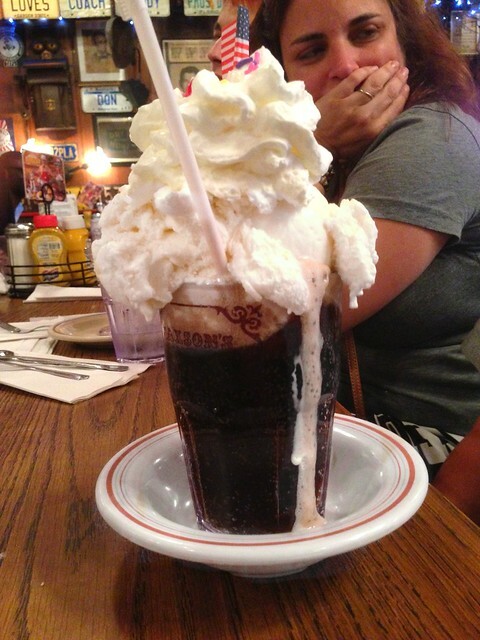 This is a cola float with vanilla ice cream and fresh whipped cream. It is big. 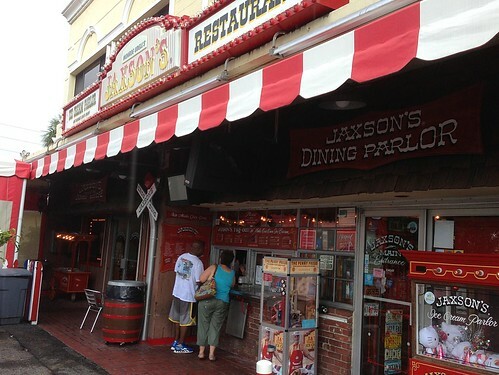 The cola that is used is actually Jaxson’s own formula, they don’t have Coca-Cola or Pepsi here. 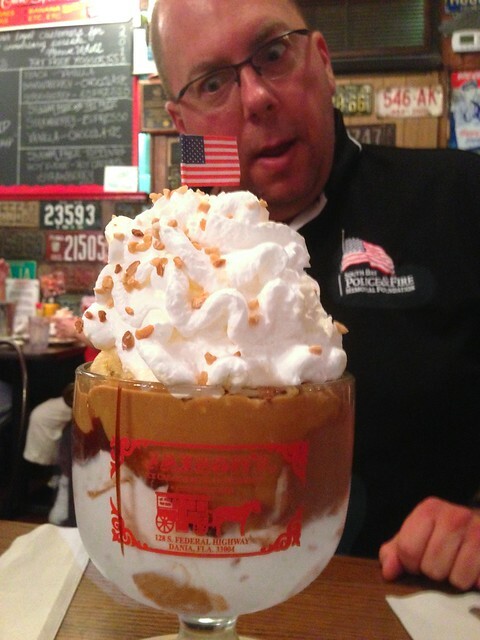 Chris and I actually decided to get stupid and ordered the “Chocolate-Peanut Gargantuan” which is crunchy peanut butter ice cream “swimming in a goblet of hot peanut butter and chocolate fudge, chopped peanuts, chocolate chips, banana and whipped cream” with a cherry on top. This is far more ice cream than any two people could ever hope to eat, especially after consuming around a pound of meat each. This required assistance from the spousal units and children to even try to put a dent in it. 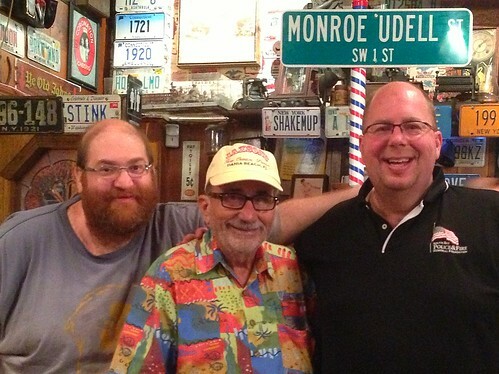 Fun food, awesome ice cream and great company aside, I think the best part of the visit was getting to meet Monroe Udell, who has owned and operated Jaxson’s for 53 years. If South Florida can claim having its own Willy Wonka, that person would have to be Mr. Udell, who despite his 85 years of youth maintains a watchful eye over everything and is still sharp as a tack. I hope he stays with us for years to come. 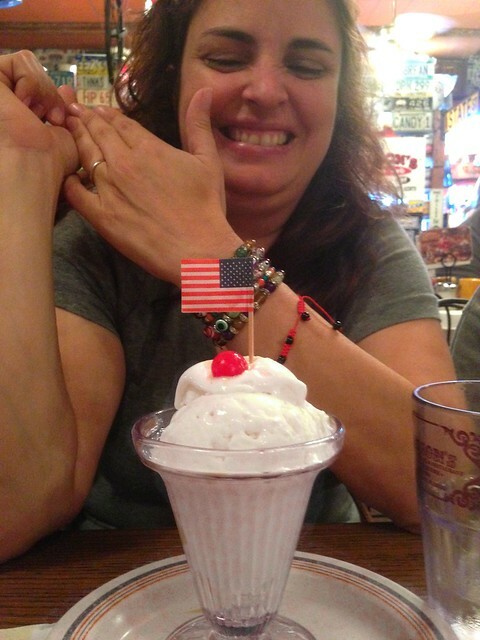 This entry was posted on Friday, July 12th, 2013 at 6:01 pm and is filed under Broward County, Florida, Food. You can follow any responses to this entry through the RSS 2.0 feed. You can leave a response, or trackback from your own site.